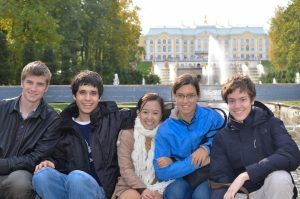 Independent University of Moscow, The Higher School of Economics, and Moscow Center for Continuous Mathematical Education invite foreign students (undergraduate or graduate students specializing in mathematics and/or computer science) to spend a semester in Moscow in the framework of our “Math in Moscow” program. The “Math in Moscow” program was founded in 2001. Since then over 350 students from 180 universities have participated in the program. Now over 100 of them have already got their PhD degrees. 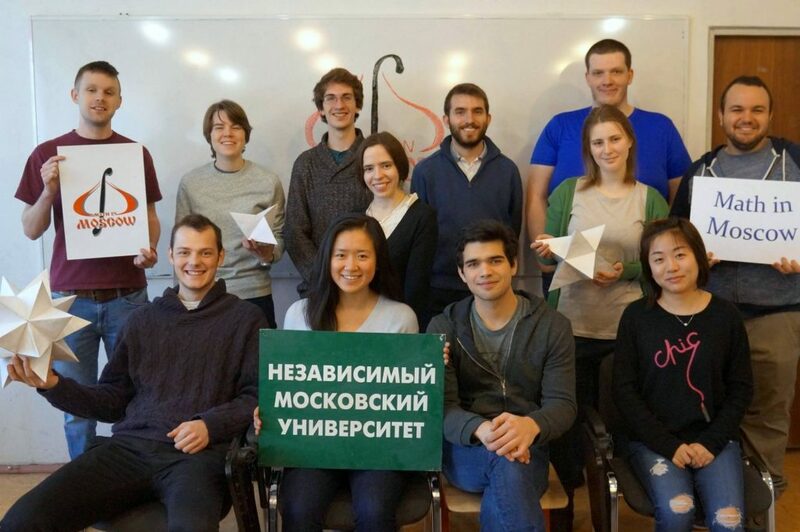 You can now gain from the expertise of Moscow mathematicians without learning Russian: all courses in the “Math in Moscow” program are in English. 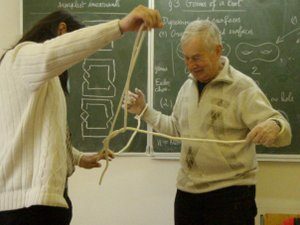 The main feature of the Russian tradition of teaching mathematics has always been the development of a creative approach to studying mathematics from the very outset. Not memorizing theorems and proofs, but discovering mathematics yourself under the guidance of an experienced teacher – this is our principle! We emphasize the in-depth understanding of the material rather than its quantity. Even in our treatment of the most traditional subjects, you will find significant connections with contemporary research topics. Indeed, most of our teachers are internationally recognized research mathematicians; all of them have considerable teaching experience in English. We stay in touch with North American universities, so after the appropriate formalities the courses taken in Moscow will be credited by your college for a BS, an MS, or a PhD degree. modest tuition, low living expenses. If you would like to learn more about the program feel free to ask our recent alumni and to read our alumni testimonials. Another good option is to discuss your questions with our representative in the USA. Additionally here are videos from the IUM and the HSE leaders speaking about the MiM mission. Recently the “Math Horizons” magazine published a paper about MiM written by our alumnus. And, of course, please email your questions about the program to mim@mccme.ru. A "Math in Moscow" semester lasts 15 weeks, see the program calendar. We offer a wide range of mathematical courses and a few non-mathematical ones including Russian language. At the beginning of the semester every student participating in the program may choose as many courses as one prefers. The first three weeks course selection period allows you to participate in courses that interest you without enrolling in them. For a successful accomplishment of the program one should pass at least three courses. Every mathematical course is taught two classes per week, each class lasts for one hour and a half. All the classes are taught in English. Most of our lecturers have extensive teaching experience in the US and/or Canada. Groups in our courses are small. That gives you an opportunity to be active, to ask questions and to discuss problems with your peers. Our professors are also focused on an individual approach to every student. Math courses are taught with an emphasis on problem solving rather than memorizing theory. A mathematical theory itself can be regarded as a set of problems solved consecutively. A very important contributing factor to a solid mathematical progress during your stay in Moscow is the group of your peers. Our students are fascinated by math and are very interested in deep understanding of its objects and their connections. We encourage joint discussions in class and in home. Our students often mention how they discuss some interesting math problem during usual friendly conversations along with other funny topics. And one of our goals is to help you enjoy those natural research-oriented settings. We stay in touch with our alumni and we are happy to see that they maintain their friendship, continue to visit each other, and meet at math conferences. The IUM is located in a cosy building in the very heart of Moscow. The address is 11 Bol. Vlasievskii per., a small quiet street near the historic Arbat, within walking distance from the Kremlin, the Bolshoi, the Pushkin Western Art Museum, and the cathedral of Christ the Savior. Besides lecture halls and classes, the IUM building has got a quiet library, a computer class, an inexpensive cafeteria which is very popular among our students, and a bookshop. Courses successfully completed in the "Math in Moscow" program will be credited by your university. One "Math in Moscow" course transfers as four semester hours. Students can usually get advice in this regard from the Department of Mathematics of their college or university. And we are glad to assist you in that communication. The transcript will be issued by the Faculty of Mathematics of the National Research University Higher School of Economics (here is a copy of the translation of the state accreditation certificate of the National Research University Higher School of Economics). Our office will send an official transcript of all completed courses to your home institution. Additional transcripts to other addresses are available upon your request for free. We offer our students two short (2-3 days) weekend trips. The first — to Saint-Petersburg, the second — to the ancient towns Vladimir and Suzdal. Both trips include sets of excursions that are not easy to book yourself. Those trips are optional and their prices are not included in the tuition fee. Of course the program does not charge any additional fee for those trips, the prices for students depend on actual booking prices only. Among our photos you can find the albums from those trips. In the first week of the semester we also organize an optional Moscow sightseeing bus excursion. And every day a lot of fascinating events happen in Moscow: concerts, current and permanent museum exhibitions, various social clubs. If you ask us for an advice we will be glad to suggest you where to go depending on your preferences and to make necessary arrangements. The IUM has modest sports facilities: a ping pong table and a small field where we hold our mini-soccer games. 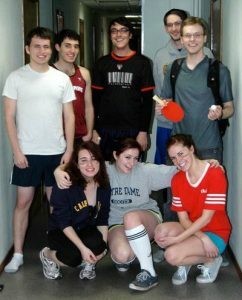 There is a ping pong table and a small gym in the dormitory. Several outdoor basketball/soccer courts are close to the dorm. The streets near the dorm are quiet and suitable for jogging. Our students are welcome to join the HSE sport clubs, for example, the HSE Ultimate club has been popular among our students. Our designated staff persons — “the helpers” — will assist you in finding anything you want to do. Previously we have set up painting courses, chess classes with chess masters, fencing practice and more. Also we can help you find necessary information if you organize your own trip with your friends. 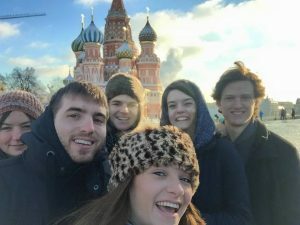 The “Math in Moscow” program wants to make sure you enjoy your time in Moscow, academically and socially and we are here to help. The dormitory for our students is located in central Moscow, about 3 miles from the Kremlin (the center point of the city). The dorm is in a very quiet affluent neighborhood, two minutes of walk from the metro station. You will be able to get to the IUM in less than 30 minutes. The MiM students will live together on the same floor of this dormitory. Other residents are international students from other programs at HSE and Russian students. We meet our students at the airport (Sheremetyevo, Domodedovo or Vnukovo) no matter what time you arrive. We are going to keep track of your flight(s) and we will provide you the phone numbers to inform us in case of any changes. We will get you to the dormitory by taxi for free and our employee will show you around and will assist you in making your stay comfortable. Our staff member will bring you a cell phone with the SIM card so you will be able to call your family and your friends very soon after your landing. After the students arrive, before classes actually begin, several days are devoted to our orientation program, during which the students learn, among other things, how to organize their lives in the new environment. for in-patient treatment, hospitalization, surgery, diagnostics, including expenses for medication, dressing materials prescribed by the doctor. For the full text of the insurance contract click here. Nevertheless we strongly advise students who have any chronic disease to have a good North American health insurance. In this case we ask a student to contact his/her insurance company and to find out if his/her health insurance is valid in Russia and how it works there. Most often the student has to pay first for a treatment and the expenses will be reimbursed on his/her return home. If you are willing to study math, have good academic standing, have completed at least one semester of both Real Analysis and Linear Algebra, you are welcome to apply. The application is free. For the details about of the application process please click here. If you are accepted we will send you all necessary documents for obtaining Russian visa. Then you will need to fulfill a few additional requirements and to apply for the visa yourself. We will be glad to answer to your questions in case of any problems. After your arrival to Moscow you will need to obtain also a registration (one can view it as a fixed-time residence permit). If you come to Russia in the standard interval mentioned in our calendar we will do all the paperwork for you and you won’t need to go anywhere. The tuition is $9000(US) for one semester or $17500(US) for an academic year. Estimated expenses of living in Moscow can be found here. Since 2001 we have established good working relationships with a lot of universities. With some of them we have formal agreements, see the list of our affiliated programs.